This activity works best in a dark space. If it is difficult to get your room dark enough, you can drape a dark cloth over a table to create a cozy space to experiment. This activity is primarily for younger children (under 6 or 7); though older children will likely still have fun. Don’t hand out flashlights until after the Maker it Matter opening discussion – once they have flashlights in their hands, it will be difficult for your students to focus on anything else! A variety of other optional materials, including aluminum foil, old CDs, kaleidoscopes, plastic prisms, clear glass or plastic jars filled with water, etc. The more materials you include; the more investigations children can develop. Ask your students if they have ever played with flashlights before. What do we use flashlights for? Have a flashlight in your hand, turn out the lights in the room if you can and ask your children what they can see in the dark. Turn on the flashlight, point it at something and ask your children what they can see now. Tell them they are going to play with flashlights and different materials to try to learn more about light. Play with these materials and see what you can do with light! Ask your students to shine the flashlight at the floor. Can they see the spot? Can they make the spot of light bigger or smaller? Let them play around for a bit until one of them realizes that moving the flashlight closer to and farther away from the floor changes the size of the spot of light on the floor. Ask that child to share that observation with everyone. 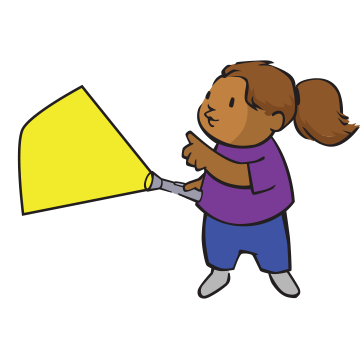 Ask students to use their hands to try and block the light coming from the flashlight. What happens? Ask them to describe what they observe. After children have played with just the flashlights for a few minutes, show them the other materials you have, and distribute at least one mirror to each child or team, and at least one piece of each kind of paper to each team as well. Encourage them to experiment with the flashlight and these materials together. Don’t suggest any experiments – let the children develop their own. If there does not seem to be much experimentation happening, you can ask one child or team what would happen if they shine the flashlight through the different types of paper. What do they observe? Ask them to share these observations with the other children. As you walk around the room and notice interesting experimentation occurring, stop the larger group each time and ask the child or team that is trying something interesting to share their observations with the rest of the group. Then encourage everyone to try it too. You should see some children shining lights through different papers, and hopefully noting differences. You may also see children shining the flashlight at the mirror. If they haven’t tried it, ask if they notice where the spot of light lands after being pointed at the mirror. How can they change where that spot lands? After 10-15 minutes of experimenting, bring the group together (you will probably have to temporarily collect the flashlights – it will be difficult for children to concentrate on a conversation with flashlights in their hands). What kinds of things did they notice? What did they try to do with the light? Can they begin to list some rules about light? Start a list on chart paper (some rules that may come up include, “Light travels in a straight line.”, “Light can go through some things and not others.”, “The spot of light gets bigger the farther away it is from the floor.”, etc.). Some of these rules will be accurate and some may not be. Encourage more testing to validate or challenge some of these rules. You can do this just in this session, or over time, adding to and changing the list of rules as you keep testing. If appropriate, you can also talk to your students about why studying light is important to scientists. When astronomers examine the light from stars, they can figure out a lot of information – not just that the star exists, or how bright it is; but also what it is made of, what temperature it is, its density, how fast it is moving, how strong its magnetic field is, and even how old it is. All by examining the light that shines from it! And every exoplanet and new solar system that was ever discovered was done so by examining the faint light from the distant stars that those planets orbit around. Send children or teams back to experiment some more. If you have some of the additional materials (CDs, aluminum foil, kaleidoscopes, prisms, jars, etc. ), hand them out to the teams and have them develop new experiments and observations. What happens if teams combine materials (ex. shining the light through tissue paper, pointed at a mirror? What if teams worked together and used multiple mirrors?). As a follow up, try the Bouncing Light activity from this curriculum. Exploring how light behaves is an important foundation in scientific understanding for young children. Everything that we see, including color, shape, and more, is because of how light interacts with objects. Light, for instance, is the only source of color. Objects exhibit different colors because of how they reflect, absorb, or transmit the colors already in the light that strikes them. And light behaves differently depending on the physical makeup of objects, too. When light shines on an object that does not allow the light to pass through it (opaque), a shadow is created. But light also slightly bends around objects. Some objects, however, can be translucent or even transparent – and light acts in interesting ways when it encounters objects like these. All of this leads to how scientists use light to discover more about our universe. In order to get information about objects out in space, like the Sun, the planets, the stars and more (all of which are very far away from Earth), astronomers need something from those objects. Because we either cannot or have not yet brought any physical material from anything outside of Earth other than the Moon, the only information we have about distant objects is based entirely on what the light created, reflected, or transmitted by those objects tells us. Astronomers use a technique called spectroscopy – the study of light broken into its component colors, and the investigation and measurement of spectra produced when matter interacts with or emits electromagnetic radiation – to learn about distant objects. Studying light can tell us a lot – not just that an object (such as a star) exists, or how bright it is; but also what it is made of, what temperature it is, its density, how fast it is moving, how strong its magnetic field is, and even how old it is. All by examining the light it emits! Every exoplanet and new solar system ever discovered was done so by examining the faint light from distant stars.